On the mat, Rafaela Silva won for her marginalized favela. In the streets, activists are winning the right to protest. There is joy in Olympic Rio, make no mistake about it. Maybe it takes two hours to travel 25 miles across the city; and maybe only 15 percent of the Olympic decorations were delivered; and maybe there are more troops on the ground, per capita, than the United States had in Iraq at the height of Bush’s war; but there is joy. This joy is an undeniable narcotic. It is a potent blend of often-ignored sports and undeniably compelling human-interest stories and, maddening as they are, the Olympics are the syringe. 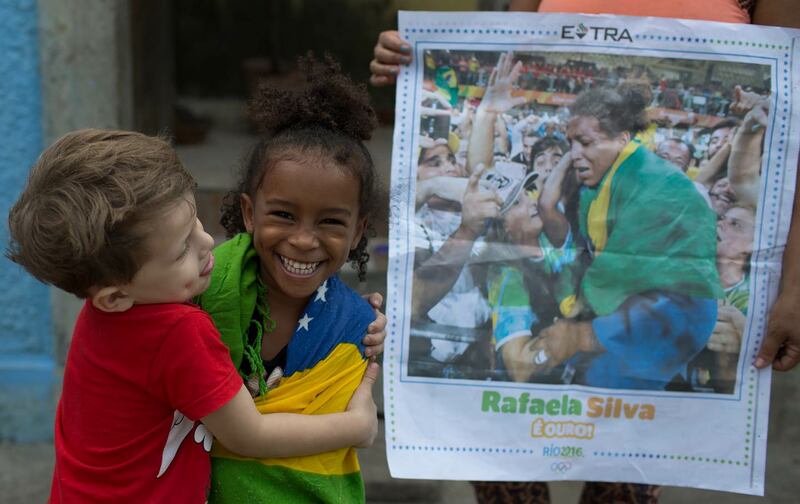 I have witnessed this joy firsthand in the rapturous response to Rio’s own Rafaela Silva, Brazil’s first gold-medalist in these games, who won gold in the judo competition. Silva hails from the internationally infamous City of God favela. While news reports have invariably referred to the judoka great as coming from a “notorious” and “crime-ridden slum”—as if she rose from the ranks of a community determined to drag her down—the reality is different. Rafaela Silva and her family are proud of their roots, and their community holds her close to their heart. Unfortunately, residents in Rio’s favelas have been displaced, and City of God has been plagued by police repression and violence in the lead-up to these Olympics. Rafaela Silva’s very existence is a rebuke to these priorities. This Olympic drug was something I also imbibed heartily, live, as Brazil’s ragtag Olympic basketball team beat powerful and heavily favored Spain by one point, 66-65, on a basket with less than five seconds to go. Hoops is certainly not one of the marginalized sports that only sees light at the Olympics, but in Brazil, where soccer, volleyball, and Brazilian jiu-jitsu reign supreme, it’s not exactly a national pastime. But going against a Spanish team packed with NBA players and led by future Hall of Famer Pau Gasol, the Brazilian team was egged on by an overwhelmingly Brazilian crowd that treated every possession like a World Cup counterattack. This was the closest experience to a soccer game that I’ve ever had in years of watching live basketball. Every successful possession by Brazil had people hugging, high-fiving, and twirling their kids—or other people’s kids. Every possession by Spain was less defined by any kind of Olympic spirit than by thousands of people engaging in some very creative Portuguese profanity. It was exhausting and when it ended, the two-hour trip back across town felt more like an adrenaline cool-down than a chore. There is joy in Rio of a different kind as well. There is joy in people who are taking advantage of the international spotlight to strike out against the invisibility imposed upon them by their own government. There are the campaigners against interim President Michel Temer—who achieved power through a judicial coup against President Dilma Rousseff—holding up “Fora Temer” (out with Temer) signs during Olympic events. During the first days of the games, activists were being arrested and detained for raising their voices. After several of these protests went viral, Judge João Augusto Carneiro Araújo issued an injunction Tuesday night against any more removals, saying that protest during Olympic events was a constitutional right. This also stands as a stunning rebuke of the International Olympic Committee’s efforts to make sure that the only political messages on display are their own. Ironically, the reason for the initial round of ejections was a law signed by Dilma in May, just before she was impeached, to prohibit racist or discriminatory chants at Olympic venues. Unless one believes that illegitimate, coup-presidents are victims of discrimination, this ruling was something to celebrate. Then there is Vila Autódromo. This is a once-vibrant community mere yards from the main Olympic Park that has been winnowed from 650 families to 24. Olympic displacement turned the unique community into ruins. When I visited Vila Autódromo in May, 24 homes remained amidst the rubble. In an effort to remove Vila as an “issue” before the Olympics, the city built 24 new homes on the same land: all near-identical white box-like structures that look like they were taken out of a box marked IKEA. But the 24 remaining families have not ended their struggle. Anti-Olympic messages are written across the walls. The families have set up their own Museum of the Removed, which documents their long struggle with the city. It contains vivid photographs of police violence, artistic testimonials to their Herculean efforts to not be brushed aside like refuse tossed into the canal that surrounds their homes. Media members leaving the brand new Courtyard Marriott who take a left toward Vila Autódromo instead of a right to the Olympic Park can, in five minutes, learn the history of an Olympic struggle against all odds. A struggle similar to that of Rafaela Silva: the struggle to be visible in a country—and world—that sees them as expendable. Resistance is its own narcotic, even more potent than the Olympics itself. Listen to Dave Zirin discuss the Olympics on this week’s episode of Start Making Sense.